The appearance of freedom of ritual. This year the appearances have been removed. All the masks have been removed. 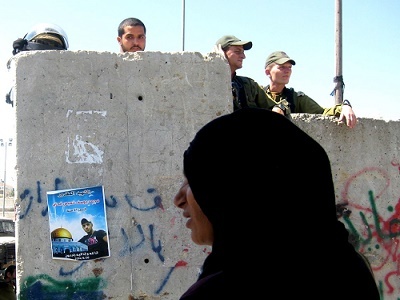 During the four Fridays of the Ramadan month in Qalandiya checkpoint the occupation had been disclosed, and all its shame was made visible in the public sphere. The public sphere was in the hands of the armed thugs alone. They searched and groped objects and bags, they photographed anyone who approached and stood from the side, they attacked verbally, insulted and shoved those who tried to take photographs and document. Both the holiday greetings that the army hung on the checkpoint fences and the words of the previous Israeli president, Peres, that: “we are not an occupying people”, were Orwellian. During the Ramadan Fridays this year few people arrived at the checkpoint and only few managed to pass the soldiers’ line. Over half of the residents of Palestine had been forbidden, due to their age, from fulfilling their religious commandment to pray at Al-Aqsa mosque. And over everyone and everything hovered a dark shadow that was cast by the arrests and killings the Israeli army preformed under the pretext that it was all done as part of the search for the kidnapers of the three Yeshiva youths. This cloud grew thicker with the outburst of the war in Gaza, which took the lives of relatives and friends and kept driving everyone insane and when the kidnapping and murder of the boy Muhammad Abu- Khdeir was made public that heavy cloud chocked everyone’s throat, including mine. “They burned him and he was still alive”, each and every one of the Abu Khdeir family members told me when I visited their home in Shuafat. “They didn’t only burn Muhammad, they also burned me”, said his father Hussein. The flames of the fire that had been set in the Gaza strip took hold and scorched also the souls of those in the West Bank. For there is a sense of responsibility and of solidarity, there is just one destiny and there is a dream and its destruction, and there is a lot of desperation and fear. The Ramadan Fridays under the rule of occupation are like a seismograph for the spirit of the people. Sadness echoed in the silent scream of those who were absent. Of all those who could pass but were frightened of the confrontation with the military forces that lurked on the long road, and of the chance that they might encounter one of the settlers’ armed militias, who wish to cause harm. Also absent were all the hundreds of people, mostly women, who during the past Ramadan Fridays would exit their homes at the break of dawn and head on the long and tiresome road to their mosque in Jerusalem, even though they knew they didn’t fit the age criteria. The women who would arrive at Qalandiya checkpoint were scorched by the sun but determined to confront the mechanism of evil with their spirits and bodies, they would stand proud, persistent and audacious before the armed soldier, they were pushed back but their spirits wouldn’t break nor would they tire or despair, they were a symbol of Sumud and protest. And on the night of Al- Qadr, during a demonstration that proceeded from Qalandiya refugee camp towards the checkpoint, the symbol of occupation, the soldiers fired live bullets and murdered a seventeen year old, who was the nephew of my friend Mahmud. “He was learning in Ramallah to be a cook”, said Mahmud. And the photos of the new Shahids, teenagers whose youth had been cut short and their futures lost, were hanging on the walls of that bad and bloody place. Like a deep crack, like a broken spirit.